The directions we’ve taken CardSpace “Geneva” are strongly shaped by feedback we received about the first version of CardSpace. One of the most frequently heard feedback points was to make the user experience less disruptive. For instance, Ashish Jain wrote about “Too many clicks”. The new “CardTile” feature, where the image of the last card used at a site can be displayed on the site’s page, enables two-click card submission, while still providing the user feedback about the card that will be used by default. The screen shot below shows an example of the CardTile in use, displaying the image of the most recently used card in the page. The “Always use this card at this site” feature takes this a step further, enabling true one-click submission to sites where you have already used a card. 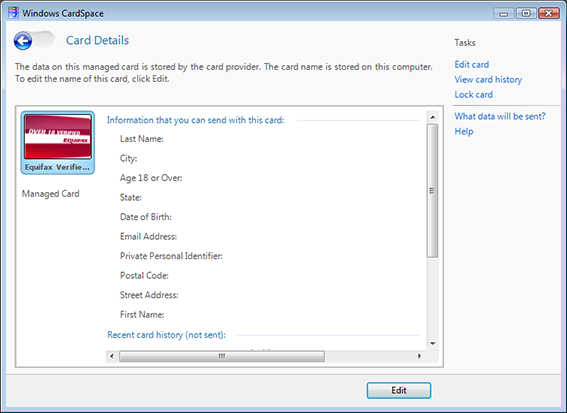 See the recent CardSpace “Geneva” Selection Experience post for more details. 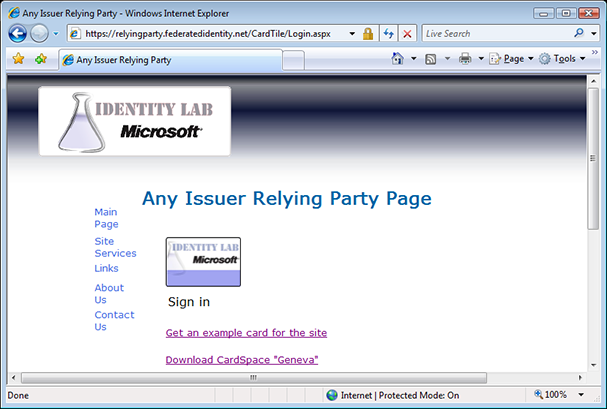 But back now to the subject of this post… The FederatedIdentity.net team has created a relying party page using the CardTile at https://relyingparty.federatedidentity.net/AnyIssuerRelyingParty/Login.aspx?tile=true. It should work both with selectors that do and don’t support the CardTile feature. Try it yourself!